It’s below zero out there, but the Vermont Sail Freight Project is not hibernating! I am very pleased to report that the timely launch of our project is looking to be as close to a certainty as one gets in this world. In the last few weeks some talented volunteers have come under the banner, too. Matthew Wright is a boatbuilder in Brattleboro, VT and is taking the lead on several research questions and will be making our sails. Christin Ripley of New York City, an experienced craftswoman who has done a beautiful work on historical boats and ships has offered to carve a nameplate for the stern and a figurehead for the bow. And Nate Wallace-Gusakov, a neighbor, friend, and talented musician has helped me write a “Barge Chantey” that captures the spirit of this project better than I could have ever imagined, let alone done on my own. The chantey is still a work in progress, so I’m not going to divulge a whole lot of its content just yet. However Nate’s verses have a quality that I have struggled to put my finger on, that I find very moving. There is an aspect of sincerity, and earnestness in the verses, of defining work that matters and a homeland that we love. A while back I remember an episode of “On-Point” (an NPR program) that raised the question, “Is irony killing us?” Are we as a culture so steeped in cynicism that we are incapable of heartfelt, sincere thought and action? I would like to say that perhaps we’re not, and maybe our little project is one sign that sincerity is not dead. I think part of what attracts people to this project is the fact that it allows its participants to be the world that they love. That is to say, in some small way, perhaps this initiative captures the spirit of this special place we inhabit, and allows us to manifest the values that unite us and the pride we share, even if doing so exposes us to the mockery of some. As a farmer who uses draft animals and pulls weeds by hand, I tend to take mockery as a badge of honor anyway. So, in the spirit of being real, here is a photo of something real. Sketch-up is a great tool, but I’m tired of posting digital visions of the boat. We’re going with real life from here on out. 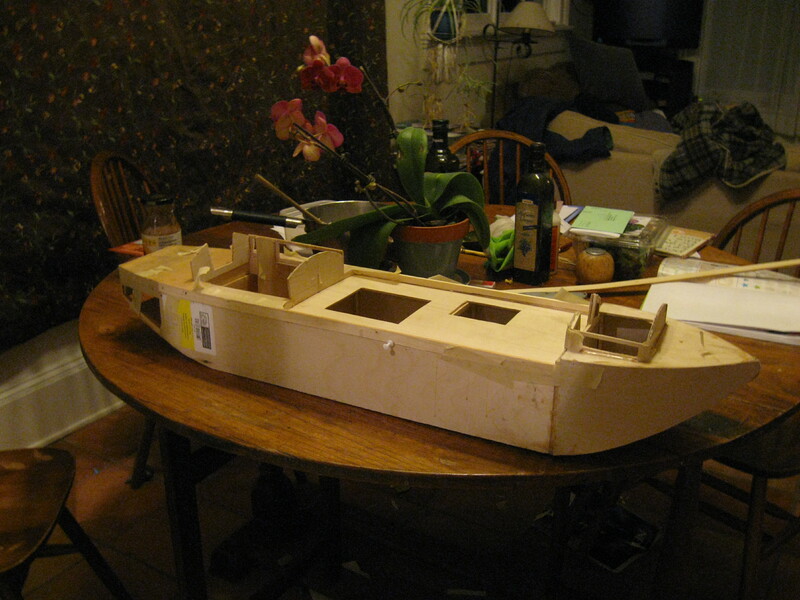 Here’s a model of the barge hull, in progress, on my dining room table. That’s where I built it, for the most part, because it’s too damn cold in the workshop. I promise I’ll clean up the mess before dinner. It is 1/12th scale, so a 36′ boat is 36″ long. This model will give us an additional tool for planning and visualizing, and also it’s nice for outreach. At a glance you can see exactly what the full size version will be and how it’s put together. I should have it painted and glossy within a week’s time. Matthew Wright, the boatbuilder I mentioned earlier, is also making a 1/12th scale set of sails, and I can’t wait to step the masts and admire them. I have even more good news to report. The Vermont Sail Freight Project was awarded a $5000 grant from the Eastman Foundation. This clear, substantial support of our project at this early stage is such a boost to our efforts, and will see us through a great deal of the construction. The whole VSFP team an I are extremely grateful for their support. Vermont Sail Freight Project has Moved!